The Deep has been named as the 17th best aquarium in Europe in the Travellers’ Choice TM awards for Zoos and Aquariums, announced by TripAdvisor, the world’s largest travel site. 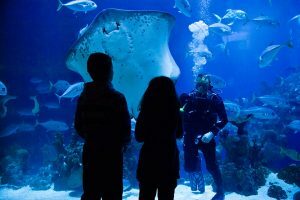 The National Marine Aquarium in Plymouth, Macduff Marine Aquarium and Dingle Oceanworld are the only other aquariums in the UK to be ranked in Europe’s top 25. Europe’s best rated aquarium is named as Oceanaria D’Lisboa. “It is fantastic news to see The Deep listed in the top 25 European aquariums, and to be the top aquarium in England and the second best in the UK is a real achievement. To find out the latest events and special offers from The Deep visit our events page.